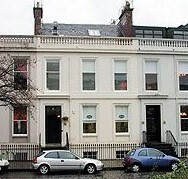 Somerset Nursery Fitzroy Place is a Victorian Townhouse ideally situated for both the West End and City Centre. The Nursery offers care to children aged from birth to three years, after which all three year old children are able to move to the fantastic Kindergarten facility at Clairmont Gardens. At Fitzroy Place, the children enjoy the advantage of their own private garden with safety surface where they can enjoy playing with their scooters and trikes. The children also have access to a small planting area within the garden where they can plant flowers, fruit and vegetables and watch them grow. The nursery is also a short walk from Kelvingrove Park where the Somerset staff and children can frequently be seen having fun and picnics - look out for the amazing "Kinderbus" in the park! ​Our baby room is bright and welcoming. Activities and play equipment promote creativity, coordination, manipulation, language development and sensory stimulus. ​Older babies are encouraged to paint, glue and bake! Water and sand play and other natural materials are introduced in the babies weekly activity programme. All babies explore outdoors daily, either going to the Kelvingrove Park to feed the birds and ducks, library, museum and local play parks. The children have regular access to our sensroy room where the children enjoy exploring a variety ot textures, lights and enjoy a wide range of heuristic play experiences. The toddler room is made up of two large playrooms for the children to explore. Staff in the toddler room strive to create a warm, friendly, welcoming environment within the room with opportunities for the children to explore new and exciting activites and experinces. The children in the toddler room have access to more challenging resources to encourage, promote and challenge their learning such as large building and construction resources, materials, dressing-up, jigsaws and shape sorters. 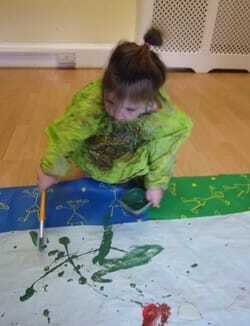 The children have the opportunity to regulary take part in large messy activites which encourages creativity and promotes social skills. The children within the toddler room also have the opportunity to explore their environment outdoors as they visit the local parks and libraries and visit the Kelvingrove Art Galleries. The Tweenie Room is spacious and bright. The Tweenie planning is devised with activities which cover all areas of the children's development and is flexible enough to adapt to the children's ever changing interests. The curriculum within the playroom revolves around a short term plan spanning as much as 3 months at a time. Throughout the plan staff will observe and plan for children's developmental needs and interests and will adapt to the children's interests as and when required. The Tweenie Room is lively and the children are surrounded by conversation and new language on a daily basis allowing the children to develop their own language skills. The children in the Tweenie Room also have access to a small computer room where the have the opportunity to explore educational software, games and puzzles. ​The Riverside Museum and the Mitchell Library. The children within the Tweenie Room also participate in children's yoga each week with their teacher Simone. Throughout their time in yoga the children develop their listening and observation skills as they listen and follow instructions from their yoga teacher and the staff. The Tweenies are very active participants in the Eco Schools project and have lots of fun planting flowers, fruit and vegetables in the garden. The nursery is a Silver Flag winner from Eco Schools programme and is working with the Eco committee achieve a Green Flag. 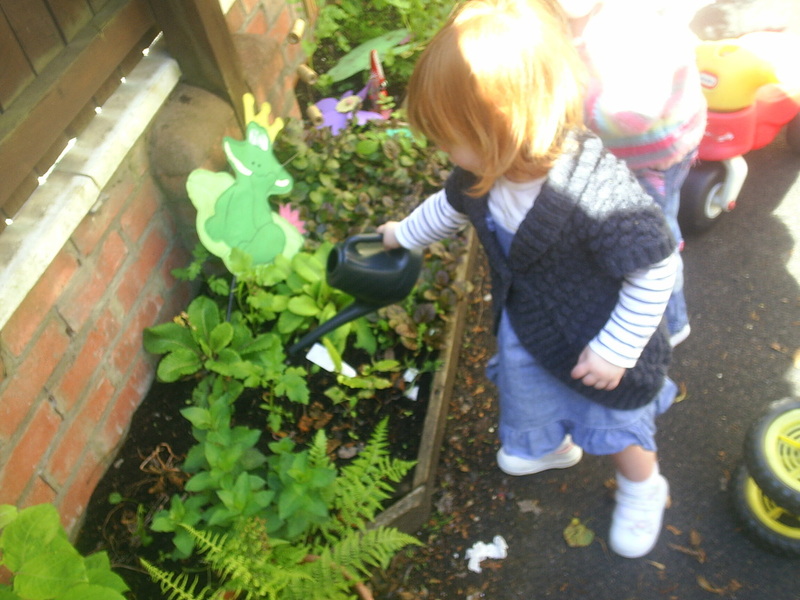 The nursery Eco Committee enjoys developing the garden area and ensures that the staff and children are aware of importance of saving water and energy. The children's garden has been designed to incorporate herb pots, planters and a fantastic new wall mural. ​The children plant a wide variety of vegetables and are always eager to see the big strawberries their strawberry baskets will produce!